Turi, 3/25 Grenfell St Where Are We? Notice how people with ukuleles have big grins? That’s because playing ukulele is the best ‘pick me up health tonic’ ever. 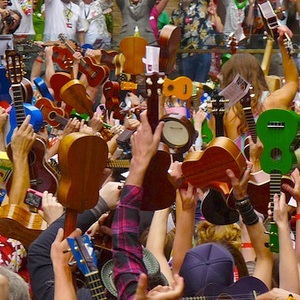 Learning ukulele is fun and easy so take the plunge and come along. 1 hour and 15 minutes of pure fun, laughter and smiles. No prior music experience required to enjoy playing the hottest, most popular instrument on the planet at the moment. You will be making music and playing songs by the end of the night. Ukuleles will be provided. Christopher Carr is the owner of The Ukulele Trading Co, a web based specialist ukulele shop. Musical Director of The NUkes Ukulele Ensemble and Member of 8 Piece Ukulele Band Ukulele Circus. Around 2009 CC had a ukulele epiphany, like most guitarists he had dismissed the little ukulele as not much more than a toy. But this was a “light bulb moment” realising that the ukulele was the perfect accessible instrument to teach music on. The featured image is borrowed and edited, with thanks, from GanMed64 under a Creative Commons license.